Traffic (Absolute & Velocity) If you are after traffic – and for some websites and companies it’s the most important factor – there is no question that Digg is the most impactful. Hitting the front page of Digg can deliver up to 50,000 uniques within 24 hours… which is incredible. In fact, the traffic comes so quickly that it often causes a “Digg Effect” – either bringing a website to crawl or collapse. Digg delivers 25,000-50,000 uniques (depending on the article and category) – but it also delivers a 1:1 visit / pageview ratio… meaning that bounce rate is essentially 100%. After Digg, the most powerful traffic driver is being linked from either a daily aggregator or a prominent blog. As examples, Sports Illustrated’s Hot Links drives 10-20,000 uniques and Deadspin can drive 5,000. Traffic comes steadily for 24 hours and then disappears into what the archives of content… in other words, don’t expect residual traffic. Techmeme and HackNews deliver consistent streams of traffic. 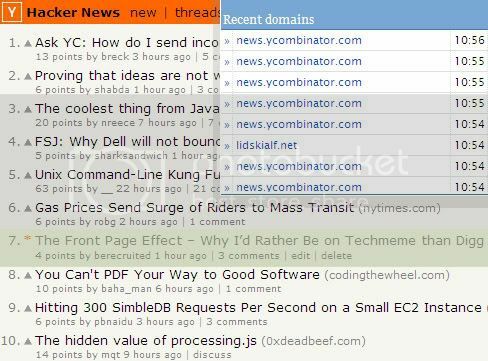 Techmeme drove 2,500 uniques to the featured post on Friday and having the top post on Hacker News will bring ~1,000 uniques. Visits coming from both sites seem to be longer than traffic arriving from Digg (1pv/visit) and blogs (1-2pv/visit). It’s tough to know whether you are ‘featured’ on StumbleUpon. A very popular page on StumbleUpon will generate strong traffic – but it’s unpredictable and consequently arrives in spurts. It’s also very tough to measure. No offense to Mixx and Reddit (and I quite like Mixx) – but the traffic really isn’t significant. If you are after pageviews, Digg is the most powerful lever you can pull … but multiples. But, it is not great at driving user engagement on your site (comments, emails, backlinks, etc). Digg users are used to interacting on Digg.com – often discussing the article with Digg’s community. This effect also exists with links from prominent blogs or inclusion in daily aggregators: users are finding your site through other locations and communities that they are already interacting on. Users will commonly return to those destinations for discussion. In general, you won’t get rich from a front page mention unless you are selling CPM ads. Of course, you can value the traffic in other ways (brand, site growth, etc) – but if your ads are on a per-click or per-lead basis, your eCPMs will fall dramatically. As an example, Digg will deliver 25-50,000 incremental pageviews… but the overwhelming result is a pageview and, after reading the content, an exit. This is consistent with traffic from major blogs, aggregators, etc – and my hypothesis again is that the user mindset is to consume and return to their original destination. eCPMs will not fall dramatically though because the traffic is not as significant. I have no way of accurately ranking the SEO value of these sites – but Digg and Techmeme are powerful. Hacker News is as well. The others are less prominent and not as optimized for search. Brand It’s also important to consider the ‘brand’ impact of making the frontpage. I would argue that appearing on the front door of any of these premier sites is good for establishing a brand / name… after all, the NYTimes and TechCrunch are regulars on both Digg and TechCrunch. If you are in technology, Techmeme brings credibility and suggests that your article is beyond just interesting – its important. Links from top blogs bring credibility in that respective vertical… also important in building a brand. 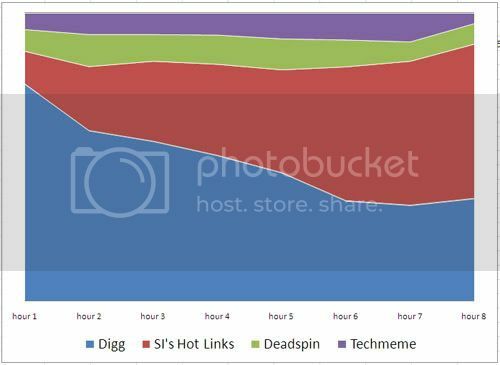 An appearance on Techmeme’s homepage (or other vertical-specific hubs) delivers 1/15th of the traffic that Digg.com can; however, that traffic is more qualified and more engaged – and therefore more valuable. *Update* After posting this article, it's gone to frontpage of Hacker News (which has a surprisingly high volume of traffic for Sunday morning). As you consider the impact of social media on your content and websites - it's important to remember that you need to be able to measure the results. Here is a screenshot of SlimStat (a plugin I use for Wordpress) - but you can analyze your logs, use Google Analytics, Mint, etc. Everyone's data will be different and the critical part is knowing what works for your site and your readers. Also, I had a couple people ask me if this means that I no longer like Digg and let me be clear: I love Digg. I use it routinely as a reader and publisher (probably too much). It has become one of my core navigational start-points for the web.